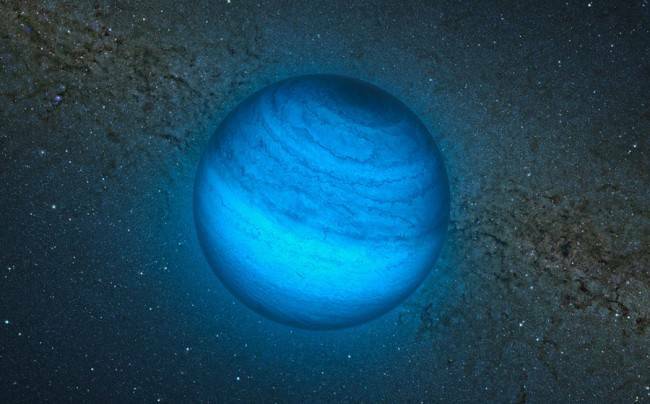 FREE-FLOATING ORPHAN PLANET SPOTTED by French Astronomers and The VALiens are first to have their interview. A Jupiter-class planet that orbits no star, but is free-floating in space has been directly observed. The phenomenon is believed to be common, but is very difficult to detect. Astronomers were on the hunt for so-called brown dwarf stars, sometimes referred to as “failed stars” since they grow like stars from collapsing balls of gas and dust, but aren’t massive enough to get thermonuclear reactions started in their cores. But when CFBDSIR2149, located about 130 light-years from Earth, came into view, scientists suspected they had nabbed something else. Too dim to glow in optical light, astronomers analyzed 2149′s infrared emissions to learn more about its chemical composition, from which they could determine its mass and temperature and then approximate its age. They found the object to be between 50 million and 120 million years old, with a temperature of about 400 degrees Celsius (752 degrees Fahrenheit), and a mass four to seven times that of Jupiter. “It’s a portrait of Jupiter in the first million years of its life,” astrophysicist Etienne Artigau, with the University of Montreal, commented for The VALiens. “It was not something that was unexpected, but to find one is very challenging,” he added. Scientists’ first clue that something unusual might be going on was the company that 2149 travels with — a very young group of stars. Presuming the object formed along with the stars, it cooled rapidly, which meant it must be small. It also is possible that the object is a brown dwarf star, albeit a very small one, that happens to find itself near the AB Doradus Moving Group star cluster. But a separate analysis projected an 87 percent chance 2149 is moving with the star cluster. That would mean that it either formed away from a parent star or was booted out by gravitational forces from its original star system. The discovery follows indirect observations of 10 free-flying, Jupiter-sized planets at the center of the Milky Way found by a technique called gravitational microlensing which occurs when a star or planet passes in front of another more distant object. Gravity from the mass of the closer body warps the light coming from the background star, causing it to brighten for some period of time. Small bodies, like planets, cause less distortion than bigger objects like stars. Orphan planets also have been found in star-forming regions in the constellation Orion. “This is the first time we have found one outside the cocoon of star-forming regions in the field. It’s not embedded,” Artigau said. “I think it’s a reasonable idea, but it’s not totally iron-clad,” added David Bennett, a University of Notre Dame astrophysicist who co-authored a paper last year about the orphan planets found with microlensing. “In general, these direct detection methods are kind of complementary to what we do, added Bennett, who estimates that there are 1.8 times as many free-floating, Jupiter-mass planets as there are stars. Astronomers will continue to study 2149 in hopes of ferreting out more details about its position and direction of travel. The research is published in Astronomy and Astrophysics.